45-Day Investor: How to Buy an Investment Property with Nothing Down in 45 Days or Less by Pine Financial Group, Inc at Spring Brook Audio. Hurry! Limited time offer. Offer valid only while supplies last. Build a real estate empire by purchasing cash-flowing rental property with no money down. Get your first property under your belt in 45 days or less! Build a real estate empire by purchasing cash-flowing rental property with no money down. Get your first property under your belt in 45 days or less! 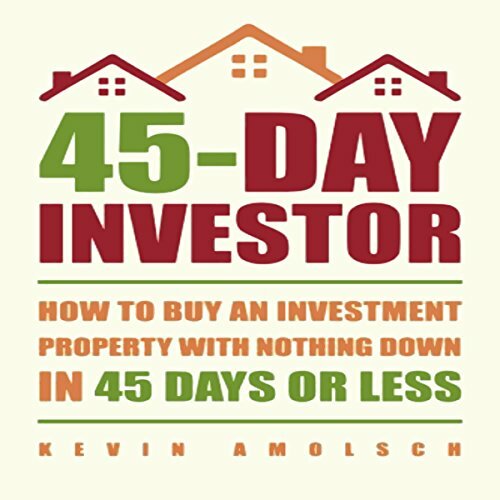 There are plenty of other books offering tips on buying rentals, but none go into detail on the specific strategies described in The 45-Day Investor. The techniques have been proven to work in all market conditions. Written by property acquisition and finance expert Kevin Amolsch, who purchased his first house at 21, this guide is a must-listen for anyone looking to buy their first (or next) investment property. In describing his personal path to success, Kevin candidly shares the lessons he's learned along the way so you can sidestep the mistakes and move on to the profits. By simply following his proven strategies, you too can acquire a cash-flowing property in 45 days or less! Discover how to successfully find, negotiate, and structure your real estate deals, all without a need for a down payment! If you have any questions about this product by Pine Financial Group, Inc, contact us by completing and submitting the form below. If you are looking for a specif part number, please include it with your message.